Is this really an issue with Sovaldi or is this an issue with specialty drug prices? Would this really be an issue if it weren’t for the large patient population? Will this profit really continue or are they simply enjoying a small period of profitability before other products come to market? Based on QALY (quality adjusted life years) is this really quick comparable cost to other therapies? If you haven’t paid attention, here’s a few articles on Sovaldi which did $5.7B in sales in the first half of 2014 and which Gilead claims has CURED 9,000 Hep C patients. But, don’t think of this as an isolated incident. Vertex has Kalydeco which is a $300,000 drug for a subset of Cystic Fibrosis patients. In general, I think this is where many people expected the large drug costs to be which is in orphan conditions or massively personalized drugs where there was a companion diagnostic or some other genetic marker to be used in prescribing the drug. Of course, the one voice lost in all of this is that of the patient and the value of a cure to them. Many people don’t know they have Hepatitis C (HCV), but it can progress and lead to a liver transplant or even ESRD (end state renal disease) which are expensive. 15,000 people die each year in the US due to Hep C (see top reasons for death in the US). So, drugs like this can be literally and figuratively life savers. These can change the course of their life by actually curing a lifetime condition. This topic of specialty drug pricing isn’t going away. What is the average weighted cost of a patient with chronic Hep C? Discounted to today’s dollars? Hard dollars and soft dollars? How does that compare to the cost of a cure? What is a reasonable ROI for pharma to keep investing in R&D? What can be done using technology to lower the costs of bringing a drug to market? For a life-saving treatment, are we ready to put a value on life and how will we do that? What percentage of R&D costs (and therefore relative costs per pill) should the US pay versus other countries? When I was at AHIP last week in Seattle, I had a chance to see Alan Lotvin from CVS Caremark present on specialty pharmacy. It was one of the best presentations that I’ve seen in a while. It was good because I actually heard things that I’d never heard discussed around specialty pharmacy before. And, as he pointed out, specialty will represent 50% of the pharmacy spend and about $235B in total spend by 2018. This is where everyone is focused and the opportunity for differentiation exists. He talked about how to get to zero trend in specialty. He talked about the consumer experience in specialty. He talked about care coordination and its value in specialty. He talked about the need for a beyond the pill approach by the specialty pharmacy. Specialty pricing is starting higher based on government pricing constraints. You can’t raise price. It’s easier to start high, discount, and/or come down over time. Pharma is beginning to price based on Quality Adjusted Life Year (QALY). Site of care (which is the hot buzz today) can save you 17% or more. Developing an exclusion formulary is important to counteract copay cards and help reduce costs. o This article says that CVS Caremark is working on a formulary with 200 brand drugs excluded. They are moving from 12-month contracting with pharma to 2-3 month contracts to really keep on top of market conditions. Coordinated care can drive lower costs in terms of readmissions and other total medical costs. He also reinforced the fact that today’s specialty benefits are not coordinated across medical and pharmacy. For example, he used the RA example where there are 9 drugs with 4 of them commonly used under the medical benefit and 5 under the pharmacy benefit. He also went on to talk about the consumer experience. I think a lot of specialty pharmacies are thinking about the same things, but there were several things he shared that were new to me. It was exciting. 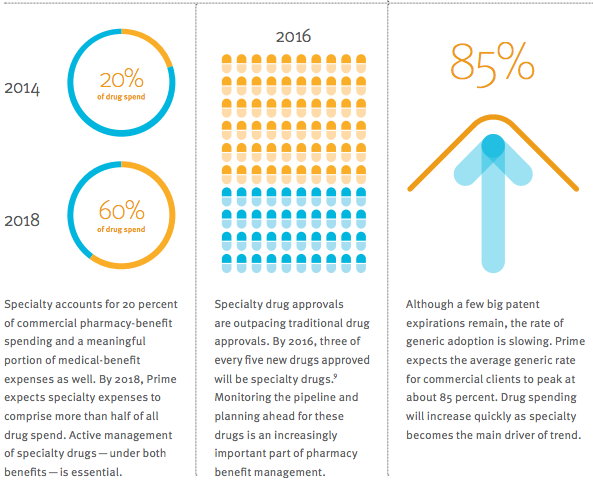 As I’ve said before, as specialty pharmacies really start to think about the patient and focus on the experience over time, we will start to see more coordination with pharma about going beyond the pill and driving lower total costs. Of course, anything anyone really cares about these days is specialty. 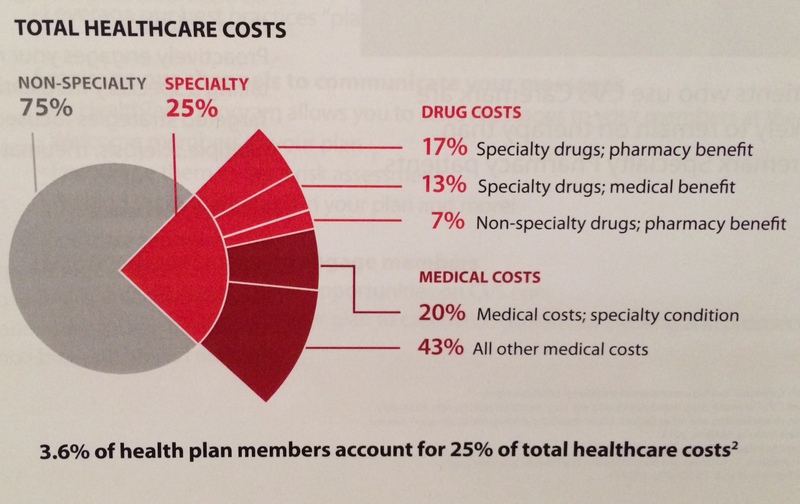 Specialty represents only 0.4% of the scripts they fill but 20.5% of the spend for a commercial account. (They point out that this is much less as a percentage of scripts than other PBMs which have closer to 1% of their scripts classified as specialty…which could influence trend numbers.) 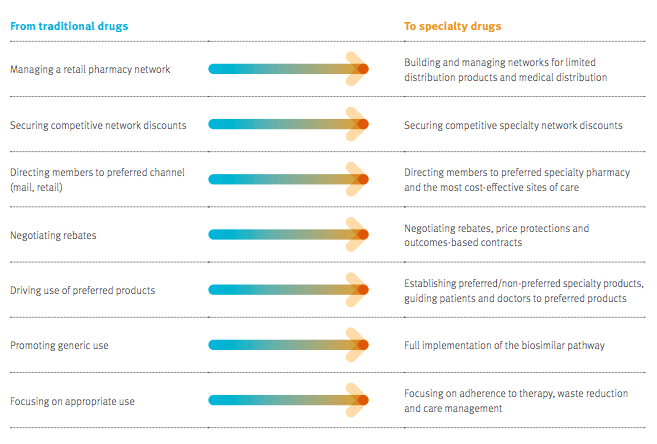 The chart below shows how some of the things we all did around traditional drugs apply to specialty drugs.